Get Ready to Have Your 'Mind Blown'! FILE - Kevin Real, a research assistant at the University of Nebraska's Center for Brain, Biology and Behavior in Lincoln, Nebraska, is fitted with a device to detect brain activity. Now, the VOA Learning English program Words and Their Stories. On this program we explore common expressions that we use in everyday life. Today we are talking about a simple verb -- "to blow." Sometimes the word means to push air out of your mouth, like when a child blows bubbles or when you blow out the candles on your birthday cake. You can also blow your nose when you are sick. Or, when you love someone, you may blow them a kiss. Those expressions are easy to understand. But what does it mean to blow someone's cover? Here is a hint: A spy might worry about her cover being blown, especially if she uses a false name and a made-up life story. When someone's cover is blown, that person’s real identity is discovered! But even us non-spies can use this expression. Anytime you present false information and then you let the truth slip out, you have blown your cover. Being discovered when you are trying to hide can be very upsetting. You could become angry. In such times, you might blow your stack, or blow your top. You could also blow a fuse or blow a gasket. These all mean to get so angry that you lose control. So, be careful when you are blowing your stack, top, fuse or gasket. When you are so angry, you might make mistakes. For example, if you blow your stack while taking a test, you might blow it. In other words, you fail it as a result of your own actions. 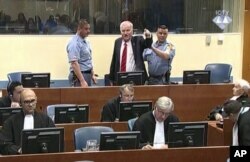 FILE - Bosnian Serb military chief Ratko Mladic during an angry outburst in the Yugoslav War Crimes Tribunal in The Hague, Netherlands, Nov. 22, 2017. You can also blow an important assignment at work. You can blow it with a personal relationship. Unfortunately, with almost anything … you can blow it! Blowing it is really upsetting. So, to blow off steam, you might go for a long walk in the woods. Blowing off steam helps us to relax when we are angry or upset. Think of a teapot. It releases steam when it gets too hot. The same can be said for us! Now, let's talk about grammar for a moment. As you probably know, when we use the active tense of a verb, the subject is doing the action. In the passive tense, the subject is receiving the action. For example, we often use the expression mind blown in the passive tense. You can have your mind blown by just about anything that’s really, really good. I've had my mind blown by a really smart movie or by a really delicious meal. We also commonly use this expression as an adjective. Let's say you are a great soccer player. Your abilities to dribble and score are mind-blowing. In fact, in your last season, every game you played was a blow out. In other words, your team beat the other team by many, many points. Now, let's say you that during one of those blow-out games, you scored the most points. So, when reporters interview you, you take credit for the win. You even criticize your teammates for almost blowing the game with all of their mistakes. As a result, your team gets upset with you, and your fans are not too happy either. Klaas-Jan Huntelaar of the Netherlands kicks a corner flag to celebrate his goal against Mexico at the Castelao arena in Fortaleza, June 29, 2014. You blew your own horn way too much. When people blow their own horns, they talk too much and too proudly about their own successes. The words may be music to their ears, but others rarely enjoy listening to people blowing their own horns. But let’s go back to your soccer game. Everyone is angry with you after you blew the press conference. So, you decide to leave town for a few days -- just until the bad press blows over. When a storm blows over, it passes. If I look out the window and see that the dark clouds moving quickly and blue skies are in the distance, I can say, "Don't worry. This storm will blow over soon." Happily for us, problems can blow over too. See? We have thousands of expressions that use the verb "blow." Okay, not really thousands. I am blowing things out of proportion. When you blow something out of proportion you make it seem bigger and more important than it is. Since we are talking about making a big deal out of nothing, we have a fun expression that means the same thing. If you make a small problem into a bigger one, you have made a mountain out of a molehill. And that's the end of this week's Words and Their Stories. I promise that I won't blow off my weekly assignment of writing another story -- because that would mean I did not do something that I was supposed to do. Have You Ever 'Played the Fool'?